Sophisticated and budget friendly, Gaels is perfect for a Corporate Holiday Invitation. Staff can easily assemble this DIY holiday Invitation kit. Handsomely eco too. The card and mailing envelope are 100% post consumer recycled paper. You can print or we can print for you. The invitation card is made from husk 105 lb cardstock, a deep handsome beige. Matching husk 70 lb. envelope. You can print inkjet or laser. We can print for you, either offset or letterpress. (Letterpress quoted separately. Call us 888.349.4684). The spun rayon wrapper is scored and the small holes at the sides are diecut out for you. The invitation closes with a length of copper paper raffia. Very handsome indeed! You can add some mistletoe or other embellishment but note that a bump will increase the postage. DIY HOLIDAY INVITATION KIT with all the tools and templates you need. Spun rayon rust red wrapper, die cut and scored. PAPER FACTS: Invitation and envelope made from 100% post consumer recycled paper, made in USA. Spun rayon material for the wrapper is made in India, but fabricated by InviteSite in Pasadena, CA. ASSEMBLY: Easy. 5x7 105 lb invitation card. Print two on a sheet and cut in half. (or we can print for you and cut to size). Closed with length of copper metallic paper raffia. 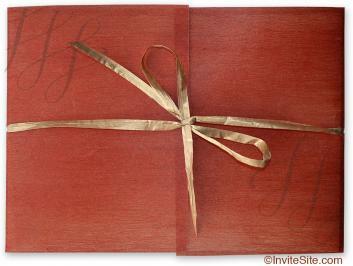 COLORS: Deep rust red wrapper, khaki tan invitation card and envelope, copper tie. Papers can be printed inkjet, laser, offset, thermography or letterpress.